Mirror mirror on the wall, which is the eco-friendliest of them washbasins? 9. Apply good design (useful, beautiful, fun, detailed, eco-friendly, functional, affordable, long-lasting, honest, local) to everything: interiors, business model, service, activities, and shop. A sink made from one single piece of ceramic. The fact that it is a shelf and a sink in one piece minimises the material used drastically. Whether the aesthetic end of life is prolonged as well is arguable but it definitely creates less waste than a standard sink. Porcelain has the big advantage of being long-lasting, at least on a technical level. But how many sinks get thrown out due to an emotional reason; because it is out of fashion or we grow tired of it. To foresee the emotional longevity of things is often harder than making stuff last physically. Even though we found some nice locally-produced designs, the fact that porcelain is difficult to recycle (we would be talking about downcycling), kept us looking for other solutions. When it comes to materials suitable for sinks, plastic is very funky and especially recyclable. We found the LTB sink by WET, made in Italy. These sinks have the advantages that they are very lightweight (2kg!) and made from 100% recyclable LDPE. They are easy to clean, child-friendly due to the round shapes and pretty much unbreakable. I am not so keen on the optional LED lighting but I don’t think it does any harm either. Still, while discussing this with my colleague Jenna Watson, among other things, she reminded us that we should think about the entire life cycle of the sink, and consider its longevity. Does it make more sense to opt for porcelain ones that last more than a lifetime of the bathroom? Waving back and forth between whether to prioritise recyclability or durability, we thought we’d look into finding reused porcelain washbasins. 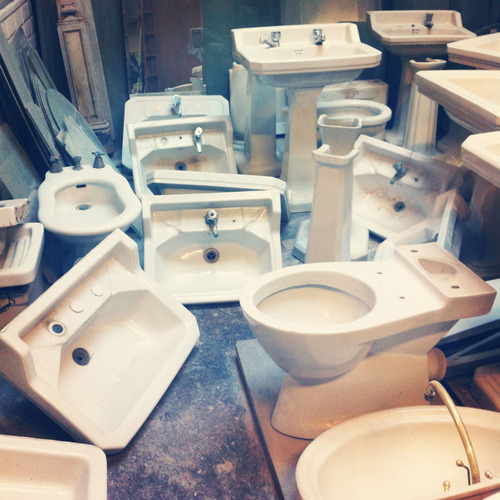 And alas, at Otranto here in Barcelona, we found 5 beautiful sinks that were salvaged from an old B&B. Of course we were lucky to find enough reused sinks that fit in our spaces. Buying second hand can be exhausting but to me it is also fun. Once you find the object, you usually also have to invest some time to fix it up. In this case, we need to find fitting low-flow faucets, cover up the remaining holes (back in the days there were two taps, one for cold and one for hot water) and find a fitting drainage system. We believe that all of this is well worth it because we saved some unique sinks from the dump and prevented new resources from being used. Moreover, our washbasins tell a story, thank you for reading it!